After 23 years in the rental business we at Camelot Party Rentals have got a solid foundation when it comes to tenting events. Tents are no longer just for Girl Scouts and die hard campers, these days they are an elegant affordable way to have an indoor outdoor wedding. 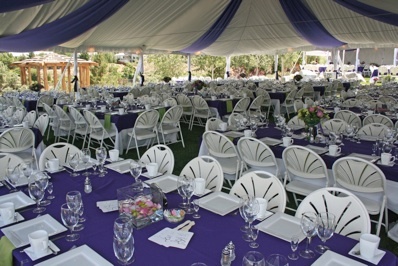 Here are Camelot Party Rental’s top reasons to tent your wedding. Rain, rain, Stay Away from my Wedding Day: Weather is an unpredictable enemy to outdoor events. Weather permitting, you can still have the outdoor wedding ceremony of your dreams, but having the reception tented offers you an elegant back up plan if the clouds come your way and the wind picks up. Your tented wedding reception will allow your guests to dance the night away after the ceremony is over without feeling the evening chill. 2. Winter Wonderland: Snow can make for a magical wedding setting, but igloos are not ideal for wedding venues. Tenting your wedding allows you to have your guests bundle up for the ceremony and then retreat into a warm temperature regulated tent for the wedding reception. 3. Find Your own Venue: Do you have an outdoor spot that is special to you and your betrothed? Make your wedding even more meaningful by renting a tent and tying the knot in that special spot. 4. Space: No one wants to feel like their wedding isn’t big enough for the room hosting it. And most venues have a capacity, which depending on how many second cousins you are inviting can create a problem come invitation time. Tenting your event can allow you to fill the space appropriately whether it is a big wedding or an intimate gathering of your nearest and dearest. 5. This Time it is Personal: Who wants to get married in another cookie cutter country club? One of our favorite things about tenting weddings is giving the couple the freedom to create the wedding of their dreams from scratch! From the location and ceremony draping to the tables and chairs, tenting your wedding allows for you to be more in control of what your big day looks like.